It is finally the season for AMD powered Ryzen laptops and Dell shipped their newest Inspiron 15 5575 to us for review. 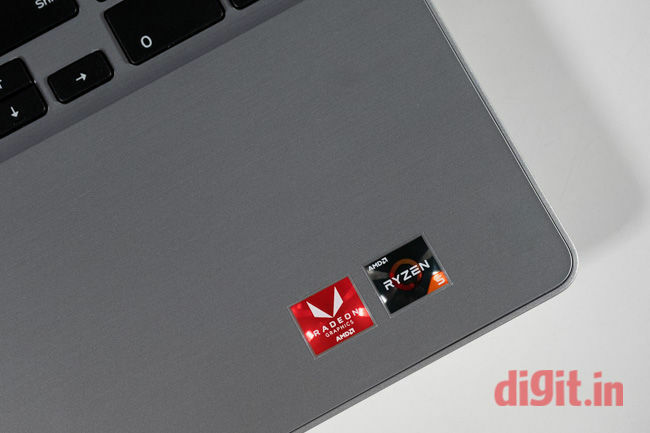 There has been a lot of excitement around AMD’s Ryzen chips for the laptop, with expectations that we would finally get a viable competitor to Intel. Currently, there are three processors in AMD’s mobile CPU line, the Ryzen 3, Ryzen5 and the Ryzen 7, all aptly designed to compete with Intel’s Core i3, Core i5 and Core i7 chips, all at a slightly lower power consumption added advantage of Vega graphics and of course, a lower price point. If there’s anything we’ve learned from the past, its that every time there is a lower price tag involved, it has served as an excuse for manufacturers to remove crucial, essential or even standard features from their product. With the Dell Inspiron 15, the goal is to find out whether Dell is leaving out basics and essentials or not. Just a point of clarification, Dell offers the Inspiron 15 in both AMD and Intel flavours. The AMD versions have the model number 5575 while the Intel variants have the model number 5570. 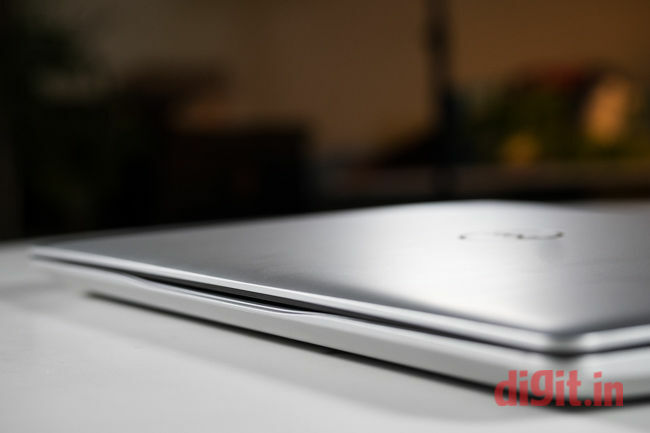 Our review covers the Dell Inspiron 15 5575. Dell Inspiron 15 (Ryzen 5 edition) employs hard plastic as the choice of construction material. 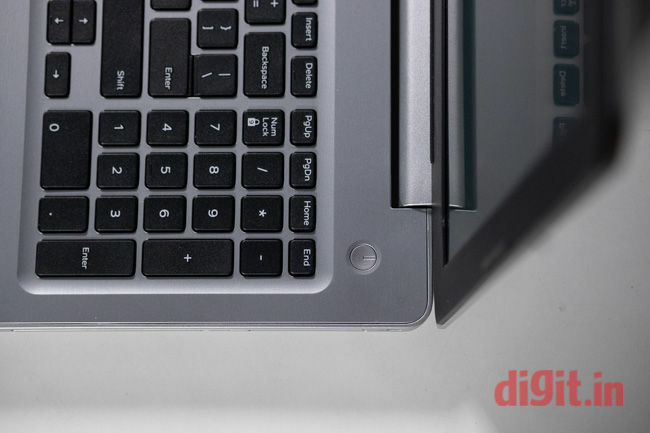 While the Inspiron 15 has no qualms about being made of plastic, it does have some nice design touches. For starters, the top lid has a curve at the front from where you would normally grab the lid to open it. This curve is designed to make lifting the lid easier and in my experience, it does do the job well. The hinges offer quite a bit of resistance, so you’re still going to have to hold the bottom part of the laptop down in order to open the thing up fully, but it’s not a bad thing. The think about hinge resistance is that if you have too little of it, then the screen will never really stay at the position you set it at and if it’s too hard, then it stays in its place precisely but makes you use two hands to open the laptop. I’d say the resistance on the Dell Inspiron 15 is pretty good. The Laptop itself was surprisingly thick, given how the trend is shifting towards trimming the excess “fat.” This is because, on the Inspiron 15, Dell has bundled a DVD drive as well. Given their target audience of office goers and average users in India, the DVD drive makes sense. In fact, having access to a laptop with a DVD drive helped me transfer almost 300GB of data from DVDs onto an external hard drive. Great tool to have because well, better to have it and not need it than to not have it and need it. The overall design of the Dell Inspiron 15 is pretty simple and standard and doesn’t really offer anything that would “wow” the buyer. It’s functional, tried and tested design with minor tweaks to the lid that adds value to it. 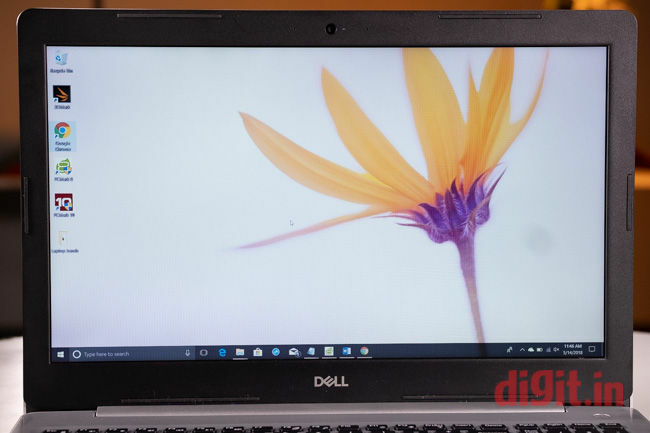 There’s a full HD display on the Dell Inspiron 15 with an anti-glare coating, one that looks sort of like what the company uses on their Ultrasharp monitors. It’s not the same coating, but the result is that if you’re viewing content under bright lights, reflections are at a minimum. The display would serve well for watching movies if it’s just one or two people there shouldn’t be a problem, but if a third was to join in, there will be a slight drop in brightness on the far right or left edge, depending on whichever it farther from the viewer. In conjunction with the display, Dell also offers MaxxAudio Pro software processing of sound which plays through two specially tuned speakers. The audio output is fine if you’re watching a rom-com or a light-hearted film, but if you want to watch action movies, which tend to be heavy on sound effects, you’re going to be losing out on some clarity. You’d be better off using headphones or external speakers for that. Moving onto the ports offered by the Dell Inspiron 15, it’s again a fairly standard layout. You get one USB 2.0 port on the right that sits beside the DVD drive and on the left, there are two USB 3.1 ports. Alongside the USB ports is also an HDMI 1.4 which can output a max resolution of 1920×1080 to an attached monitor. It is interesting to note that the AMD Ryzen 5 2500U which incorporates Vega 8 graphics, can support monitors with up to 4K resolution over HDMI 2.0, but Dell has chosen to limit this by using an HDMI 1.4 port. While this may seem like a bad move on Dell’s part, there are real, performance-based considerations to also take into account for allowing 4K output. More on this in the performance section. There’s also the customary SD card slot, but what was refreshingly nice to see was a full-size Ethernet port. The Dell Inspiron 15 (Ryzen Edition?) offers adequate connectivity options and as such, doesn’t really disappoint. There’s no end to how much we can ask of a company, but for a machine with a price tag of Rs. 49,990, asking for an additional USB 3.1 Type-C pot wouldn’t be out of line. The keyboard on the Dell Inspiron 15 (Ryzen) is as standard as you would expect a keyboard to be. The keys are adequately spaced which make long typing sessions fairly comfortable and devoid of frustration. The num-pad is also slightly roomier, but still cramped enough that it will take some getting used to. Typing on the keys is a pretty good experience. The keyboard is a chiclet-style keyboard and hence the keys don’t have a lot of travel. However, if you’re going to be typing, there is enough travel to register the right amount of feedback. The rebound on the keys is sharp and there was no sponginess on the keys (used to it type roughly 10,000 words). Once nice touch to the keyboard is that the power button is not a part of the keyboard, meaning there should be no accidental shut downs. The power key sits on the top right corner of the keyboard island, within a gently sloping depression so that your finger can find the button with just the use of touch. The touchpad is silky smooth on the Dell Inspiron 15 and I was surprised as to how responsive it was to movement. Using Microsoft’s Windows precision drivers, the trackpad is quick to register gestures often used in Windows 10. The left and right click buttons did feel al little weird, with some uneven bend across both of them, but at no point did a mouse click go unregistered. If you don’t have an external mouse, the trackpad will help you get by just fine for day-to-day tasks like navigating the operating system, working with MS Word, browsing the web etc, but if you’re going to be engaging in work that requires precision such as editing photos in Photoshop or Lightroom, you might want to invest in a wireless mouse. Now let’s get to the question that’s on your mind; how does the Dell Inspiron 15 (Ryzen Edition) perform? Our review unit of the Dell Inspiron 15 was powered by AMD Ryzen 5 2500U processor with Radeon Vega 8 graphics baked in. The system had 8GB of DDR4 RAM (2400MHz) some of which was being shared by the graphics chip. AMD claims that the Vega 8 chip can yield superior performance in comparison to the integrated graphics provided by Intel. At the price point, getting a laptop with a Nvidia graphics chip would be a long shot, making the AMD powered machines an automatic preference, at least on paper. First, the Dell Inspiron 15 went through a series of benchmarks. On 3DMark’s Firestrike, it managed a score of 2460 and on the Firestorm Extreme benchmark, it scored 42137. The Asus Vivobook S15 in comparison scored 44527 while being powered by a seventh generation Intel Core i7 processor. On the PCMark10 benchmark, the Dell Inspiron scored 2957, not a very high score by any means. Since benchmarks don’t always tell the full, accurate story, I also used the Dell Inspiron 15 as my daily driver for over two weeks. This, of course, involved writing many stories, but also plenty of photo editing. For editing, I use Adobe Photoshop and Adobe Lightroom, for typing, MS Word and of course, Google Chrome for my access to the internet. In my usage, it was obvious that while the machine itself wasn’t slow, boot times and application load times were on the slower side. This is due to the fact that the Dell Inspiron 15 uses a standard 1 terabyte 5400 RPM hard drive. Swap this out for an SSD and I’m pretty sure there would be a noticeable boost in speed. Also, the 8GB RAM is the max you can get pre-installed on this machine, but Dell allows for it to be expanded to 32GB. However, Dell recommends that anyone looking to get these upgrades goes to a Dell store to get the job done. Coming back to day to day performance, Adobe Photoshop ran surprisingly fine, being able to handle up to 3 RAW files (each weighing about 30 megabytes) at the same time. The only time performance dropped was during the “Save for web” operation, where the full-resolution preview took far too long to generate (about 140 seconds). Working with Adobe Lightroom was barely manageable, for a catalog that contained about 300 RAW files, all stored on the local, internal hard drive. There seemed to be a noticeable lag in all operations of Adobe Lightroom, causing some delays in the final export. I also tried playing Doom, Metro Last Light and Forza Horizon 3 on the machine, to no avail. The games wouldn’t run in the “ultra” graphics setting, forcing me to settle for the “low” setting. Even then, the frame rate wouldn’t go over 15fps. 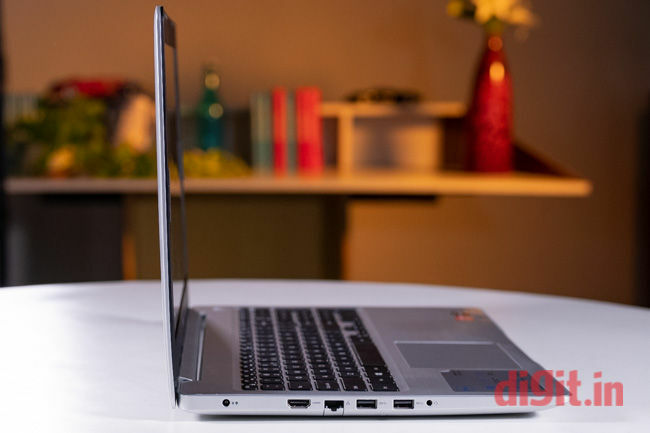 Daily simple tasks such as writing stories, watching/streaming full HD movies (yes, work sometimes requires it) and even simple photo-editing were no big deal for the Dell Inspiron 15. In fact, if the machine is to be upgraded to higher RAM and a fast SSD, it would make for a very reliable machine for anyone from an office worker to a college student. The Dell Inspiron 15 (Ryzen Edition) comes with a 3-cell 42WHr battery. I was able to squeeze out about 4 hours of my workday using the laptop, but I do generally keep the screen brightness on the lower side (about 35-40 percent). Watching a 2 hour long full HD movie on internal speakers drained roughly 30 percent battery, with the brightness turned up, but not all the way. On the PCMark 8 battery test, the laptop lasted about 178 minutes, which lines up with my daily usage. The Dell Inspiron 15 is one of the first AMD Ryzen powered laptops to hit the market in India, but it is definitely not the only one. We are just starting to laptops powered by AMD’s newest APUs make their way into the market and the Dell Inspiron 15 is one machine that shows the potential challenge it poses. Let’s just first consider the fac that an Intel 8th-gen core i5 powered Dell Inspiron 15 with the same hardware spec will cost you roughly Rs. 4000 (give or take) more. The AMD Ryzen 5 2500U chip is a pretty impressive chip, and furthers the case for the Dell Inspiron 15. Couple this with the fact that the machine supports upto 32GB DDR4 RAM and the HDD can be swapped out for an SSD, giving users plenty of headroom for future upgrades. The Inspiron 15 makes for a great office use laptop. Its going to serve students well, especially those who hope to get through all 3 (or 4) years of college using just one laptop. 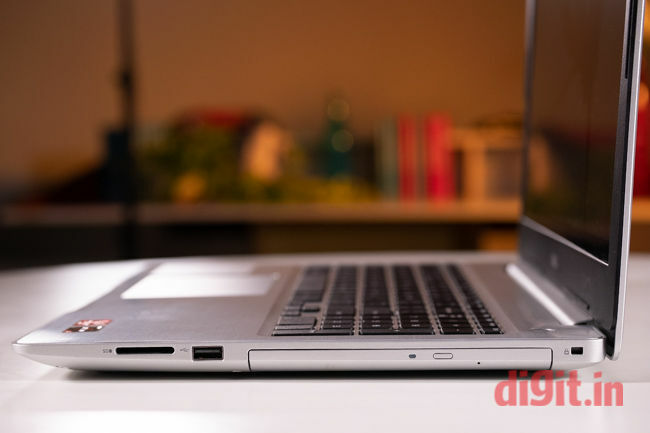 However, while the Dell Inspiron 15 makes for a decent performer, it does lack certain essentials that have become commonplace, such as a fingerprint scanner. There’s also no backlighting on the keyboard either, which makes this machine difficult to use for work in the dark.